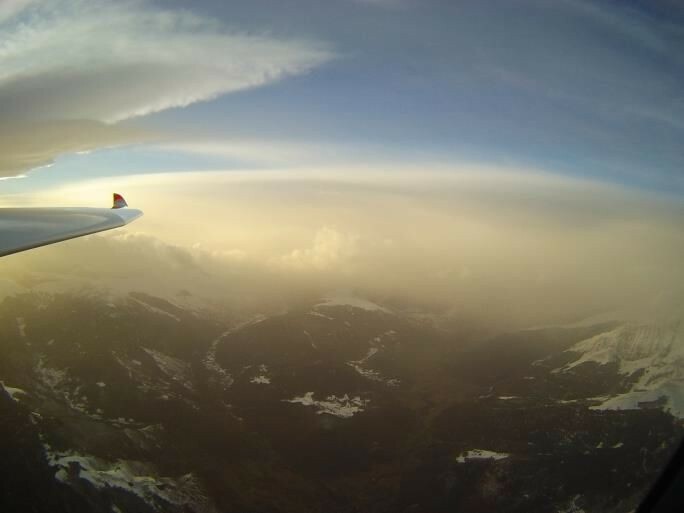 February 12th was the perfect day for gliding, but quite unexpected! I finally decided to fly on Sunday, just the day after coming back to Toulouse very late in the evening. 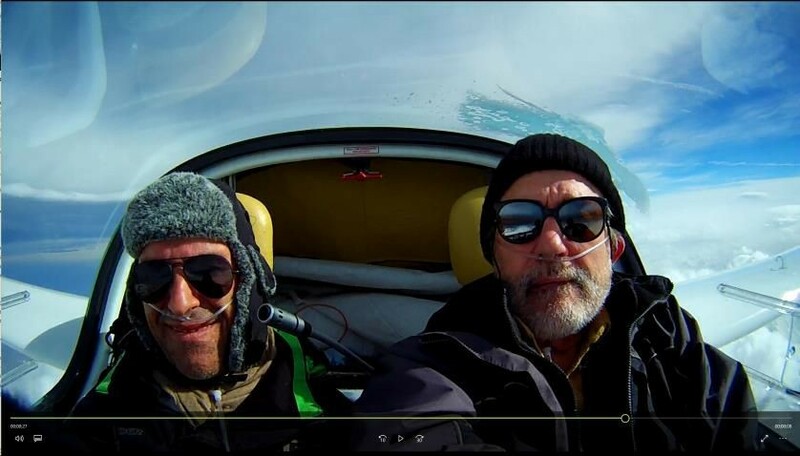 The meeting time with my friend Louis Mesnier, a hang-glider pilot, was scheduled for the next morning at 06h15 AM in Toulouse to go to St Gaudens together. There is only one hour drive to the St Gaudens airfield, perfectly located at 3 minutes from the exit of the motorway. I think that St Gaudens airfield is the best place in France to complete very big circuits in any conditions: waves conditions (north or south) and even in thermal in summer (Spain or France). The spirit of St Gaudens’ team with a dynamics for big flights is just amazing, with the guidelines of Mr. Robert Prat and the direction of Mr. Sebastien Nore with a very friendly pilot group. With Louis, we arrived at around 07:30 AM and took off just before 08:00. The Pyrenees were overcast on the Spanish side, but some rotor formed the waves and the lift spots well. My Taurus with self-launching engine is the key for big flights. Having a self-launching glider is a big advantage, as you can start at the precise position you want, and I usually don’t hesitate to climb up to 3200 meters or more, to be directly in the laminar air and to eliminate loss of time in the strong turbulence of the sub waves. 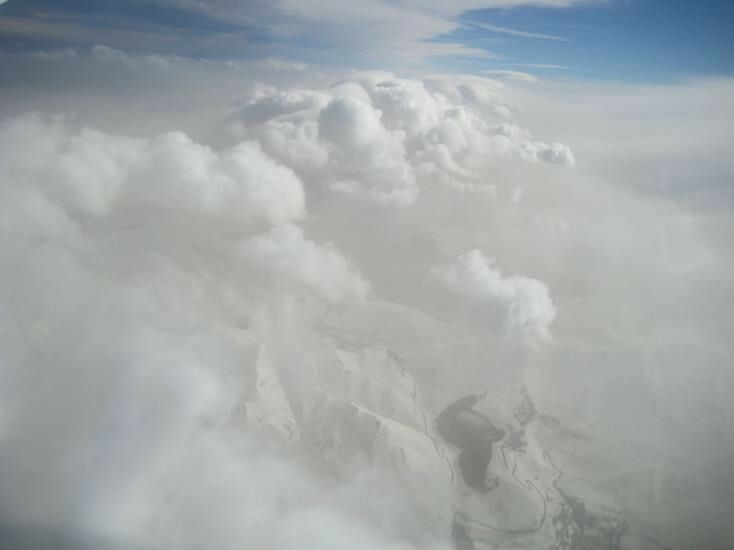 On that day we entered in the laminar air already at 2500 meters, so we turned off the engine and started to climb in the strong lift. Usually I prefer to start by climbing to the max authorized altitude 6000 meters (FL 195) but as we topped at 4200 meters, we decided to go westward to reach the jump of Arbizon and Pic du midi de Bigorre. We lost 1000 meters in only 20 km but because of that we directly reached the lift of Arbizon where we climbed to 5600 meters. The wind was not very strong, 75km/h from the 200°, which is quite perfect for waves over the Pyrenees. The jump was nicely formed even though the cloudiness was quite strong. One of my big questions I often have on wave flights is at what speed I should fly in the waves with knowing the polar curve of the glider. The LX 9070 computer does an excellent job with the Mac Ready calculation, but it doesn’t integrate the wind speed component – but since the lift spots are fixed from the ground, it is essential to integrate the head wind component in the speed calculation. 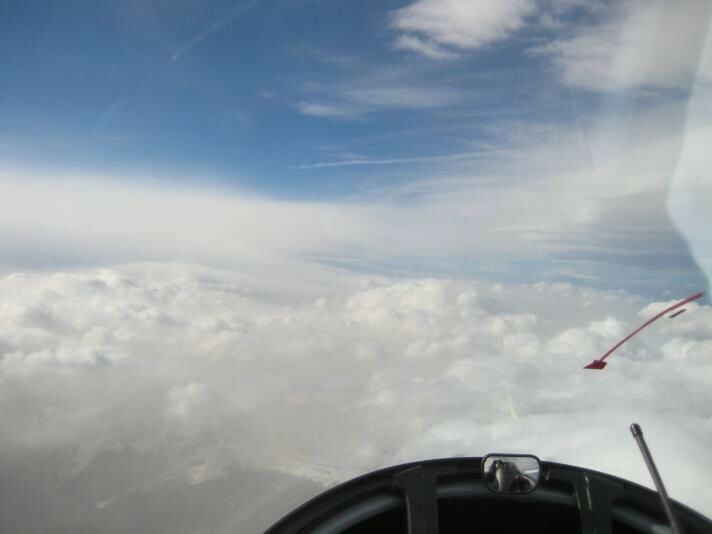 I have worked on glider polar curve to find a simple rule to be used in flight, which would enable me to fly at the best speed depending on the lift, the vario netto and the headwind component. So I worked on quadratic equation of the polar curve (pure math) to find a rule (I call it “Waves rules”) to determine at which speed I have to fly depending on those 3 parameters. I discovered also that the Taurus has a quite good potential of speed, even with very strong head wind in waves condition. This is due to the very good medium speed characteristics of the Taurus (120 km/h to 160 km/h) and the altitude coefficient of speed (about 30% bonus at 5000 meters). So we flew between 120 and 160 km/h indicated speed to west direction, and as the wind was quite orthogonal to our course, we had only 20-25 km/h head wind component which is not significant above 5000 meters. One big difficulty in southern waves over Pyrenees is to find a lift spot between Bagnères de Luchon (South of St Gaudens) and Pic d’Anie, 100 km west of Luchon. The lift spots are not always where they should be, so on the first leg you have to be careful. 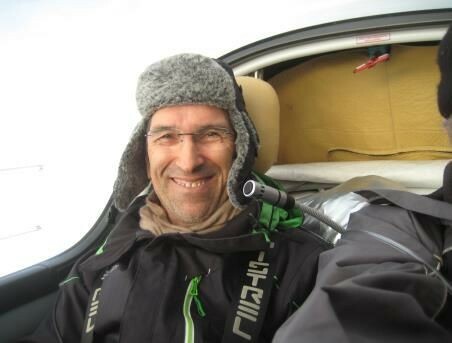 Here I would like to thank Mr. Michel Belaygues, who is usually flying his Apis, but who unfortunately couldn’t fly on that day. He had helped me a lot on all the flights we did together before, and he taught me how to find a good track to fly by on this difficult part of the mountains. But on that day the lift was quite well materialized and the jump spots (Arbizon, Pic du Midi, Gourette and then Pic d’Anie) were located just as expected. 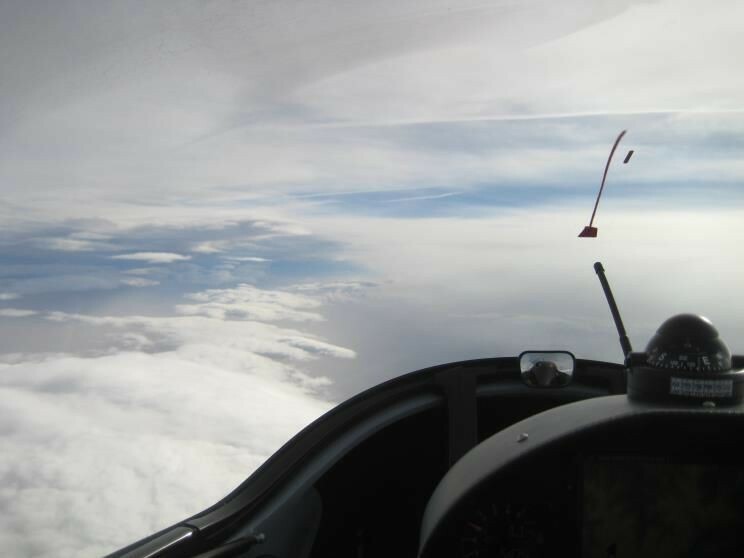 The wave was very good and several times during the flight we nearly reached over-speed, so we used the airbrakes to keep below FL195 with netto sometimes at +6 m/s. Theoretically rotor cloud isn’t supposed to move away from the mountain, but I think this is quite false, since the rotor always moves as pushed by the wind, then disappears and a new one is generated a few kilometers ahead. It is not easy to see if you are well-positioned on the rotor (staying always ahead of the small rotor, the furthest in front of the wind). So we tried to position ourselves correctly on the rotor every time, but we always checked to be at a good distance from the ridge of the mountain by applying the “Robert Prat” rule (a math equation which helps to calculate the distance of the jump spot from the mountain ridge according to the wind speed). His rule works perfectly and it is amazing to see how accurate it is. I took all the benefit of having a high resolution map on my LX9070, which gave me perfectly accurate positioning. So on that day we glided quite fast to the first turn point at Santesteban, south of Biarritz. The glide was easy and we stayed high all the time, close to 5500 meters. We turned at 10:30, 2 hours after we started the circuit. One hour later at 11:33, the jump is still perfectly in place. The return was even easier, because we used tracking on the LX9070 with netto colour, showing where there was some lift on the track. There are two airways of class D in the vicinity, so a clearance with radio and transponder from Bordeaux Control is mandatory for their crossing. During this flight (as well as for other gliders flights of our club) we easily obtained the crossing clearances and the controllers kindly facilitated the task, sometimes with very operational traffic information to cross IFR aircraft. A big thank you to all those controllers for their benevolent efficiency. The jump was very well formed at Bareges and we decided to stay in it, so we took the Luchon direction and then Val d’Aran. We continued to Ariege valley of Ax-les-Thermes, applying the Robert Prat rule and we turned at Roc Blanc at 12:30, when the humidity of the East destroyed the waves after La Llagone. The return was even easier because the waves stayed remarkably stable and the jump was very well materialized. We stopped only three times to gain a few hundred meters in each of them. We arrived over Santesteban at 14:44 and saw that it would be possible to make at least 100km more in the western direction, because a magnificent lenticular was there. But I just wanted to improve my record of 800 km and I preferred to stay on the secure course, so we decided to turn back to do the Carlit Leg again. During the flight in the eastward direction we stopped only 2 times, 4 minutes in each of them, and we did the 310km in 1h45, arriving at Carlit at 16:32. A panorama with the “Vulture of the Pyrenees”, Mr.Louis Mesnier over Santesteban for the second time. We achieved 1130km in Netcoupe (OLC 3 points) and we still had 2h15 potential of flight. But our oxygen bottles were nearly empty, so even if 150km more was achievable in OLC 5 points (going west again), we decided to come back to Saint Gaudens. All together we did 1263 km in OLC. It was a perfect day and even though sometimes the visibility was not excellent, the jump was very well marked. The theory claims so, but in practice I was still very astonished by the speed the Taurus can achieve on a circuit flight. On the last four legs we flew 1035km in 6h40 which is an average speed of 155 km/h (157km/h if same altitude departure – arrival).